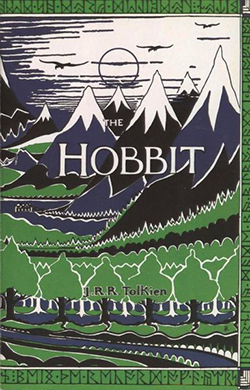 1937: Before there is The Lord of the Rings trilogy, there is The Hobbit . J.R.R. Tolkien’s fantasy novel is first published on this date. Often thought of as the prelude to the Rings trilogy, The Hobbit was Tolkien’s first book. It tells the tale of a simple hobbit cajoled by a wizard into joining the quest to recover stolen treasure. Tolkien enjoys a lofty reputation among devotees of fantasy fiction, but it was a long time coming. Fantasy was not a popular fiction genre at the time he wrote The Hobbit , and the work was dismissed by most critics as fanciful juvenilia. In fact, Tolkien said later that the story evolved from tales he spun for his own children. Nevertheless, the novel was a commercial success for Tolkien, although he would continue laboring in the shadow of his closest literary contemporary, C.S. Lewis. Image: J.R.R. Tolkien drew the artwork himself for the first edition of The Hobbit, published in hardback in 1937 by Allen & Unwin. This article first appeared on Wired.com Sept. 21, 2007.